Accommodation/Crew: A crew of seven consisting of the Pilot, Flight Engineer, Observer/Nose Gunner/Bomb-aimer, Navigator, Radio/Wireless Operator, Mid-Upper Gunner, and Tail Gunner. The Bomb-aimer was in the nose position below the front turret. Above and behind and to the port is the Pilot’s position in a raised canopy with good all-round vision and armour plating on the back of the seat and armour protection behind his head. Inside the canopy immediately aft of the pilot’s seat is the Fighting Controller’s position and is provided with special bullet-proof glass. Slightly aft of this position is the Navigator’s position, with table, chart stowage and astral done in the roof. At the rear end of the navigator’s table and just forward of the front spar is the Radio Operator’s station. Within the centre-section is a restroom with a bed. Aft of the rear spar is the mid-upper and mid-lower turrets, together with various equipment stowage for flares, emergency rations, etc. A dinghy is carried in the centre-section trailing-edge portion of the wing and is automatically deployed and inflated upon impact with water. It can also be operated by hand. In the extreme tail is the rear turret. A walkway is provided along the entire length of the fuselage and the main entrance door is situated on the starboard side just forward of the tailplane. Design: Chief Designer Roy Chadwick and Managing Director Roy Dobson of A. V. Roe Aircraft Company Limited based on the Avro 679 Manchester design. Defensive Armament: A total of ten 7.7 mm (0.303 in) Browning machine-guns in a nose, mid-upper, tail and ventral position. The ventral position was soon deleted on most RAF Lancasters as it was thought unnecessary and took the same position as the H2S radome. Where possible, and unofficially, many crews installed a single 7.7 mm (0.303 in) or 12.7 mm (0.50 in) Browning machine-gun on aircraft lacking the ventral turret in order to deal with the ever increasing ‘behind and below’ attacks of German night fighters using Schräge Musik, which interesting, did not use tracer ammunition. These were hastily installed configurations usually consisting of the gunner sitting on a bicycle type seat with the ammunition box being bolted to the floor and the gun mounted in a hole cut into the floor. The British would eventually re-introduce the F.N.64 turret on aircraft equipped with G-H radar (an improved version of Gee) since that type of radar did not have the large radome as the H2S required. During 1943/1944 when the use of Schräge Musik on german Nachtjagd (night fighters) became widespread, the new twin-gun F.N.64 power-operated turrets became the most important gun position on the bomber. On aircraft that were modified to carry the “Tall Boy” or “Grand Slam” bombs, most had the nose and mid-upper turrets were removed and the tail turret reduced to a single pair of 7.7 mm (0.303 in) Browning machine-guns in order to reduce weight. The 7.7 mm (0.303 in) ammo consisted of Ball, Tracer, Armour Piercing and Incendiary. Blast & Demolition – 1 x 8,000 lbs (3628 kg) HE plus up to 6 x 500 lbs (227 kg) HE bombs. Blast & Demolition – 14 x 1,000 lbs (454 kg) bombs. Blast, Demolition & Fire – 1 x 4,000 lbs (1814 kg) HE ‘Cookie’ plus 3 x 1,000 lbs (454 kg) HE bombs plus up to 6 SBC (Small Bomb Cannisters) each holding either 236 x 4 lbs (1.8 kg) or 24 x 30 lbs (13.6 kg) incendiaries. 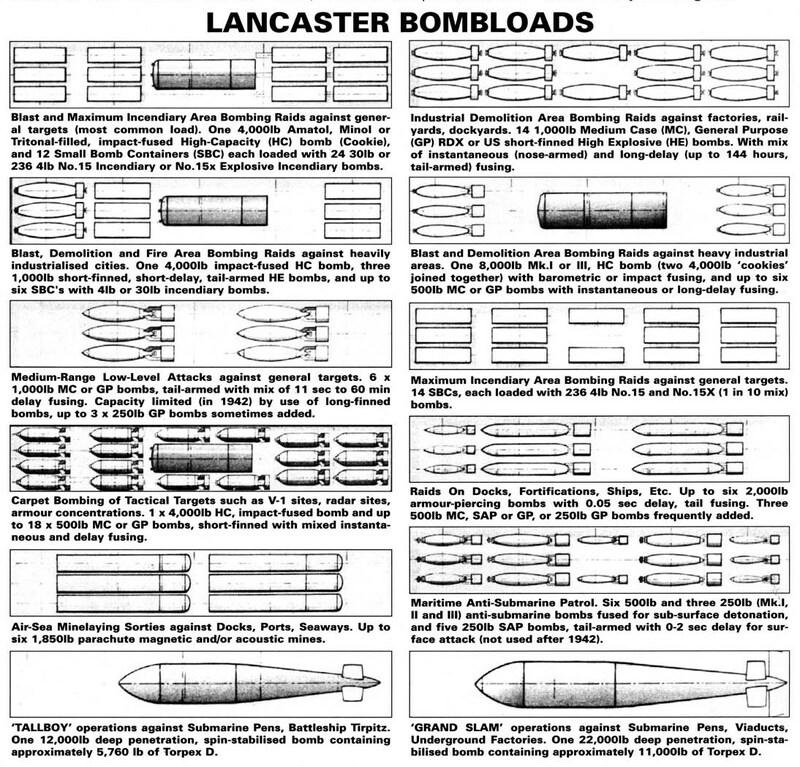 Blast, Demolition & Fire – 1 x 4,000 lbs (1814 kg) HE ‘Cookie’ plus up to 12 SBC (Small Bomb Cannisters) each holding either 236 x 4 lbs (1.8 kg) or 24 x 30 lbs (13.6 kg) incendiaries. Maximum incendiary – 14 SBC (Small Bomb Cannisters) each holding either 236 x 4 lbs (1.8 kg) or 24 x 30 lbs (13.6 kg) incendiaries. Deployed Tactical Target – 1 x 4,000 lbs (1814 kg) HE ‘Cookie’ plus up to 18 x 500 lbs (227 kg) HE bombs. Low Level Attack – 6 x 1,000 lbs (454 kg) HE bombs with delayed action fuses. Hardened Targets & Ships – 6 x 2,000 lbs (907 kg) AP bombs with very short fuses. Mine Laying – Up to 6 x 1,500 lbs (680 kg) or 1,850 lbs (839 kg) parachute sea mines which could be either acoustic or magnetic. First used on the night of 3/4 March 1942. Equipment/Avionics: The Mark IXA Course-Setting Bomb Sight (CSBS) and the Mark XIV Computing Bomb Sight (CBS) were standard. The Radio section is complete with a Marconi Transmitter T.1154 and Receiver R.1155 with a Morse key on the right of the wireless operators table. The operator was also provided with a switching gear to connect crew positions to the receiver or transmitter if required. H2S “Fishpond” Indicator 182 aircraft detection display plus all the auxiliary equipment. The Navigators section contains the Gee & Oboe radio guidance navigation equipment, H2S main blind bombing/mapping radar with the PPI (Plan Position Indicator) plus all the navigation aids used prior to the introduction of the Gee, Oboe & H2S radars. An improved H2X radar would replace the older H2S radar after German FuG 350 Naxos Z radar equipped night fighters could home in on the H2S radar transmissions. Some aircraft used the “Monica” tail mounted early warning radar which was effective to a range of about 1,000 yards, but had no IFF (Identification Friend or Foe) capability. Monica was discontinued in use when it was discovered that German FuG 227 Flensburg radar equipped night fighters could actually home in on the transmission signal given out by the Monica radar. Rebecca navigation radar was also used on small numbers of aircraft. Boozer early warning radar (ground and air) was also used and considered better than Monica. Tinsel was an electronic warfare jamming device which in its early use was successful, but German response to the device limited later effectiveness. An automatic gun-laying apparatus (A.G.L.T) code-named ‘Village Inn’ was fitted to the F.N.121 tail turret to allow radar guided beyond visual range firing. The device although potentially devastating, it originally lacked the ability to distinguish between Friend or Foe. The aircraft is also fully equipped for night flying. An F.24 camera was standard equipment for vertical photography to confirm bombing accuracy. Wings/Fuselage/Tail Unit: The wings are of a mid-wing cantilever monoplane type. The wing is made up of five main sections, comprising a centre-section of parallel chord and thickness which is integral with the fuselage centre-section, two tapering outer sections and two semi-circular wing-tips. Subsidiary wing units consist of detachable leading and trailing-edge sections of outer wings and centre-section, flaps and ailerons. All units are built up individually with all fittings and equipment before assembly. Two-spar wing structure, each spar consisting of a top and bottom extruded boom bolted on to a single thick gauge webplate. Ribs are aluminium-alloy pressings suitably flanged and swaged for stiffness. The entire wing is covered with a smooth aluminium-alloy skin. Ailerons on outer wing sections have metal noses and are fabric covered aft of the hinges. Trimming tabs in ailerons. Split trailing-edge flaps between ailerons and fuselage. The fuselage in an oval all-metal structure in five separately assembled main sections. The fuselage backbone is formed by pairs of extruded longerons located halfway down the cross-section of the three middle sections. Cross beams between these longerons support the floor and form the roof of the bomb compartment. “U”-frames and formers bolted to the longerons carry the smooth skin plating. The remaining sections are built up of oval frames and formers and longitudinal stringers, covered with flush riveted metal skin. All equipment and fittings are installed before final assembly of the separate units. The tail unit is a cantilever monoplane type with twin oval fins and rudders. Tailplane in two sections built up in similar manner to the wings, the tailplane spars being joined together within the fuselage on the centreline. Tailplane, fins and rudders are metal covered with the elevators covered in fabric. Trimming tabs in elevators and rudders. 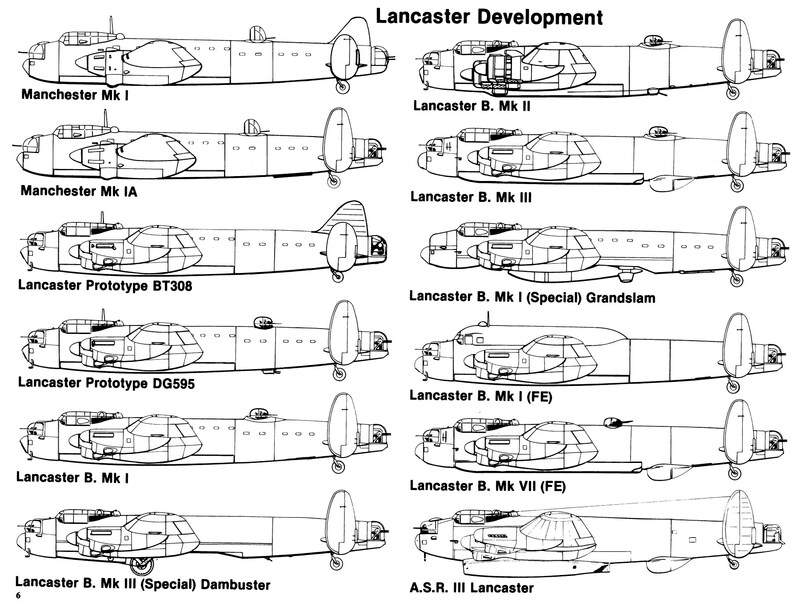 Units: The Lancaster equipped Nos. 7, 9, 12, 15, 35 (Madras Presidency), 44 (Rhodesia), 49, 50, 57, 61, 83, 90, 97 (Straits Settlements), 100, 101, 103, 106, 109, 115, 138, 149 (East India), 150, 153, 156, 166, 170, 186, 189, 195, 207, 218 (Gold Coast), 227, 514, 550, 576, 582, 617 (Dambuster), 619, 622, 625, 626, 630 & 635 RAF Bomber Command Squadrons. 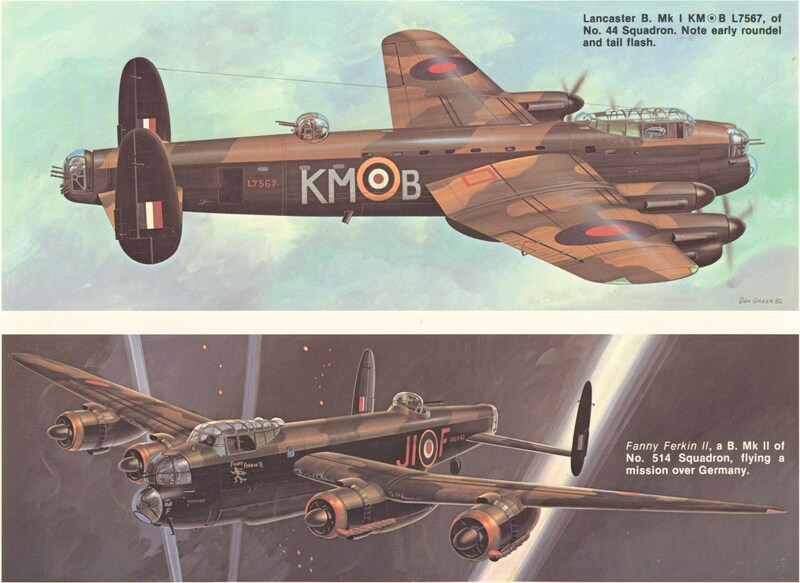 The Lancaster initially entered service with No. 44 (Rhodesia) Squadron based at Waddington followed by No. 97 Squadron and then No. 207 Squadron. No. 300 (Masovian) was an all Polish Squadron serving with the RAF. Squadron No. 101 was a special unit whose aircraft could be distinguished externally by three large aerials on top of the fuselage. They carried the top-secret ABC (Air-Borne Cigar) from October 1943 onwards. ABC was a jammer working on the German night fighter frequency and required an additional member of the crew to operate it. Lancasters of No. 101 Squadron carried a full load of bombs and scattered throughout the bomber streams, accompanied the Main Force on nearly every raid. In the later stage of the war, with multi-pronged raids becoming the norm, 101 Squadron would become the largest Lancaster squadron of all, with a final complement of 42 aircraft.